After a week that showed a drought conditions dramatically degradeacross Colorado, a small area showed slight improvement in the central part of the state. Southern Jefferson County, along with slivers of Park and Douglas counties, moved into abnormally dry conditions, an improvement from moderate drought. While portions of southeast Colorado border counties showed some improvement in drought conditions, a new area of "exceptional drought" - the worst category - appeared elsewhere in the region. Eastern Kiowa, Prowers and Baca counties showed improvement over the previous week, moving to moderate and severe drought. 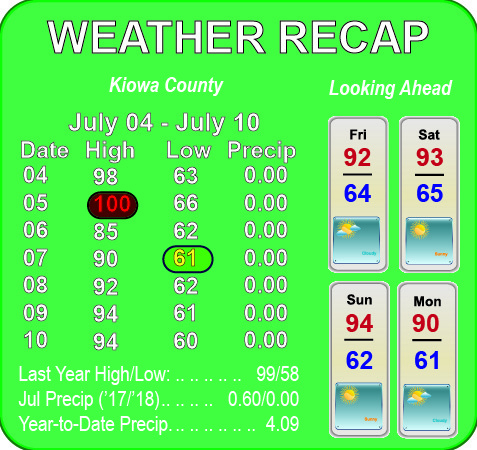 A small portion of northeast Kiowa County shifted into abnormally dry conditions, while much of Baca County has shed extreme drought over the past month as early summer storms continue to bring much-needed moisture to the area. Tips: Keep Your Cool in Hot Weather! Read more about Tips: Keep Your Cool in Hot Weather! During the 2017 disaster season, three severe hurricanes devastated large parts of the U.S. The quick succession of major disasters made it obvious that such large-scale emergencies can be a strain, even in one of the world's richest countries. As fires scorched more than 200,000 acres in Colorado, drought conditions deteriorated for part of the state. Abnormally dry conditions expanded in western Larimer county, while moderate drought returned to northern Routt County, along with smaller portions of Moffat and Jackson counties. Conditions in the remainder of the state remained stable, with more than one-third of Colorado in extreme over exceptional conditions, the two worst catagories. Lack of rain and increasing summer temperatures contributed to worsening drought conditions in central and southwest Colorado over the past week. Severe drought expanded north across northern Fremont and southern Chaffee, Park and Teller counties, while extreme conditions also advanced to cover Custer and Pueblo counties, along with southern Fremont and El Paso counties. Extreme drought also spread in Delta and Mesa counties. The National Weather Service Storm Prediction Center in Norman, Oklahoma, has issued a severe thunderstorm watch for eastern Colorado counties, which will remain in effect until 8:00 p.m. Friday. Wind gusts could reach 75 miles per hour, with potential for hail up to 2.5 inches in diameter, in areas where storms form. Tornadoes are also possible. Shortly after noon Friday, radar showed a line of storms across central and northeast Colorado, which are expected to move toward the southeast as the day progresses. Southeast Colorado counties along the border with Kansas saw some improvement in drought conditions over the past week. Eastern Baca, Prowers and Kiowa counties saw extreme drought pull away from the border, dropping to severe conditions. A narrow portion of north central Kiowa County along with parts of southern Cheyenne County moved to moderate drought from severe conditions. A similar improvement was also noted in central Lincoln County. Upper 90s will be replaced with low to mid-80s by Monday, with increasing chances of rain coming to the area just as an early wheat harvest gets underway in some parts of Kiowa County. Saturday's high will reach 90, accompanied by south wind in the 20 to 30 mile per hour range. Gusts to 40 mph are possible. Later in the day, tropical moisture and the remnants of Hurricane Bud begin to flow into the area, bringing a chance of afternoon and evening showers and thunderstorms. A tenth to a quarter inch of rain is possible overnight as temperatures fall to the mid- to low 60s.